5. Accept, or click Browse to change the path to your web browser downloads folder. 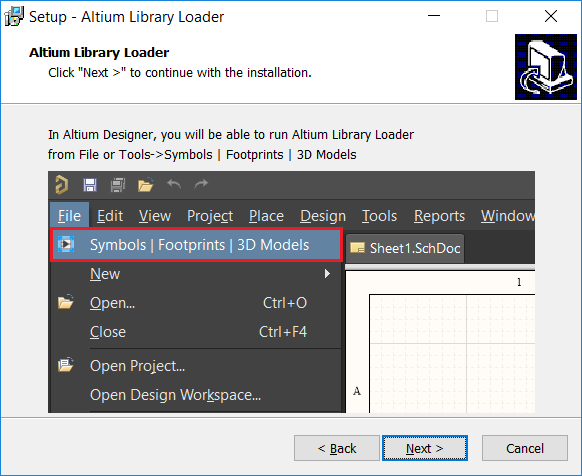 Note: This sets the default folder in which Altium Library Loader opens downloaded ECAD Models. Then click “Next >” to continue. 6. Click “Next >” to continue. 7. 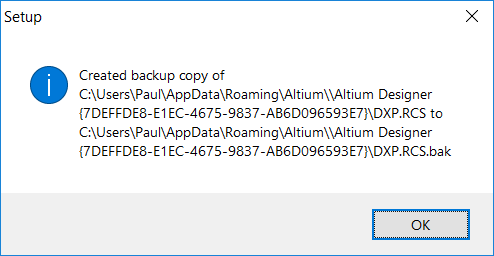 Note: The installation will create a backup of the file (DXP.RCS) that is modified to customise the Altium Designer menus. Click “OK” to continue. 8. 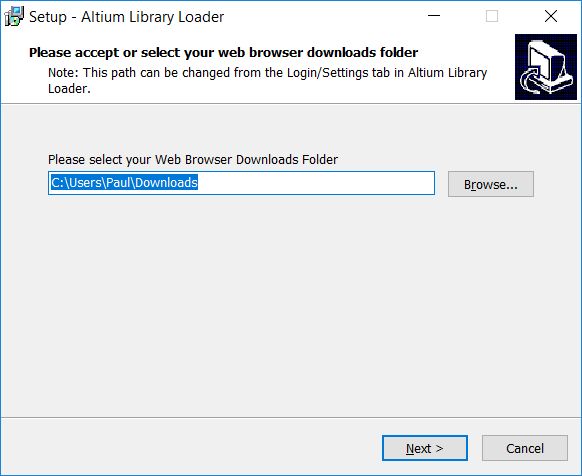 Once the installation is complete, a web page is opened to prompt you to launch Altium Designer. 1. 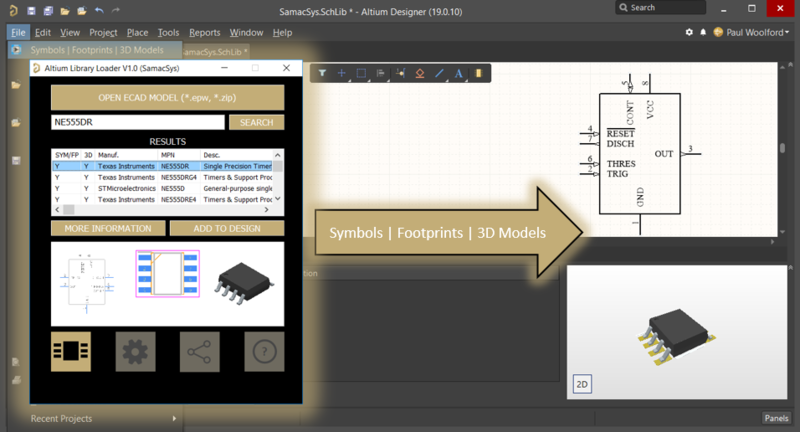 Select “Symbols | Footprints | 3D Models” from the File menu. You will need to Uninstall Library Loader from Add or Remove Programs. 2. Enter or Register for a FREE SamacSys Account. Note: If you previously had Library Loader installed then these account details will be filled in for you. 3. 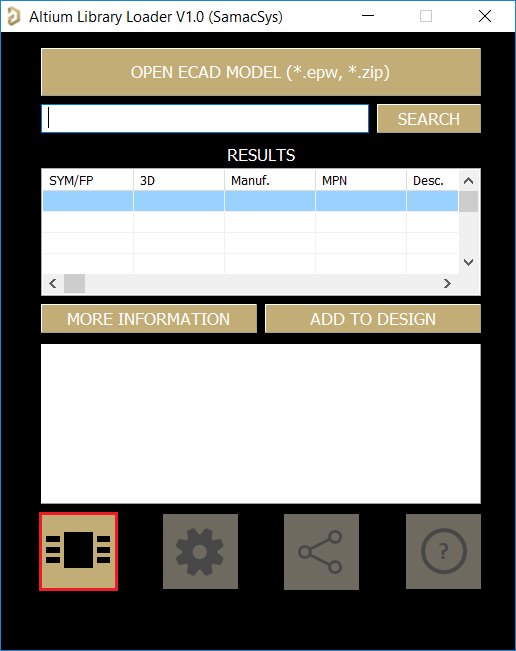 Click the “ECAD Models” button. 4. Enter Keyword(s) in the SEARCH box and then press Enter or click the SEARCH button. 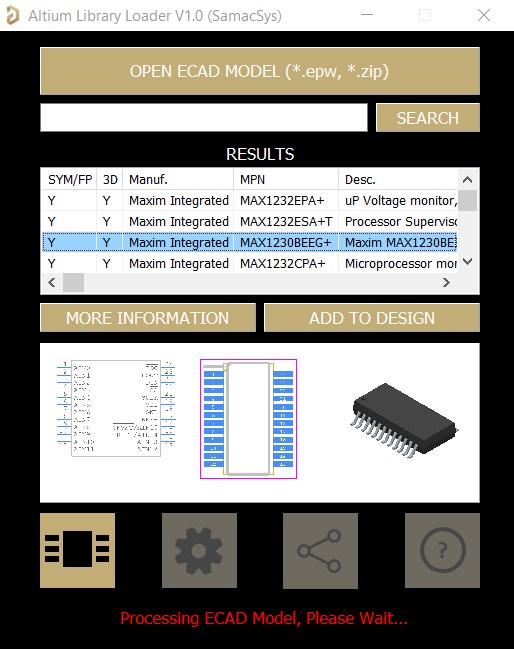 Alternatively, you can click “OPEN ECAD MODEL (*.epw, *.zip)” if you have downloaded an ECAD Model from our or a partners website. 5. 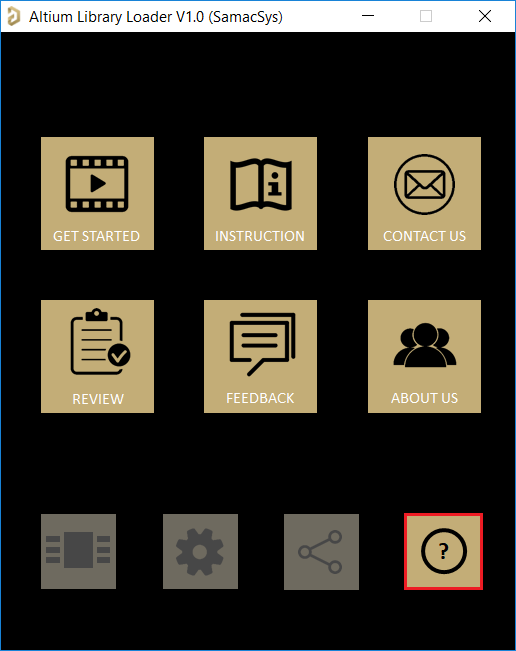 Select and review the part you wish to use, and then click ADD TO DESIGN. 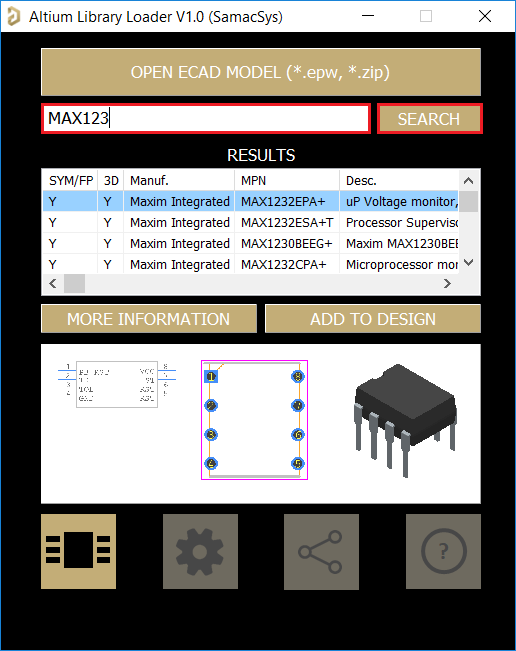 Note: You can also click MORE INFORMATION to gain access to Datasheets, Pricing, Stock and Pinout data. 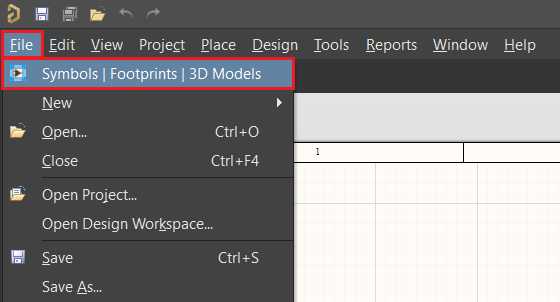 You can also click the Symbol, Footprint and 3D Model images to view them in more detail. 6. 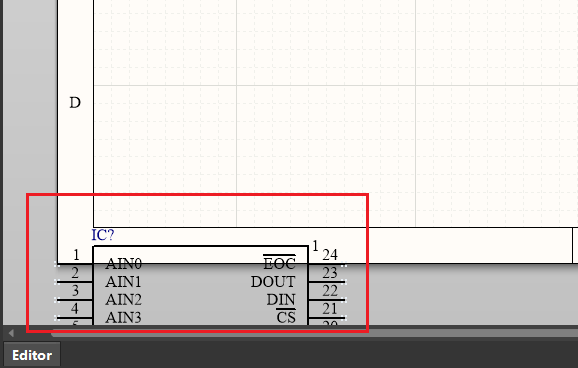 If you receive the following message, then you will need to create a new or open an existing schematic (*.SchDoc) before clicking the ADD TO DESIGN button. 7. Altium Library Loader will now build the ECAD Model into your library. 8. The part will then be placed in the bottom left corner of your schematic ready for dragging into place. Note: To prevent this message from popping up every time you ADD TO DESIGN, you can uncheck “Show ADD TO DESIGN Instruction” from the Login & Settings page. 9. 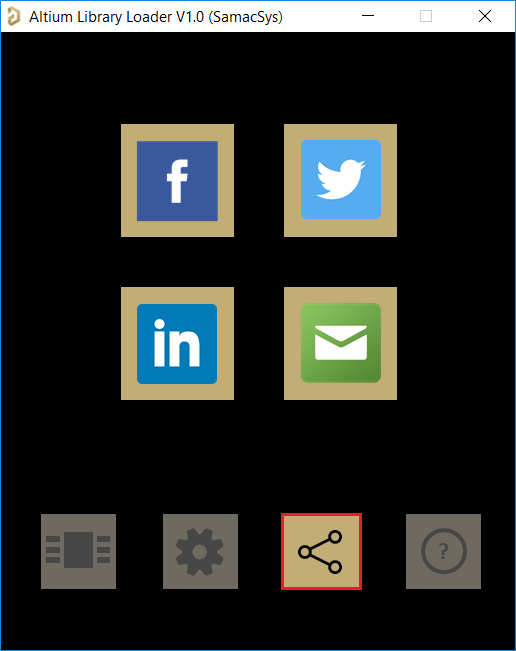 The component will now be in your library complete with Footprint and 3D Model. 10. 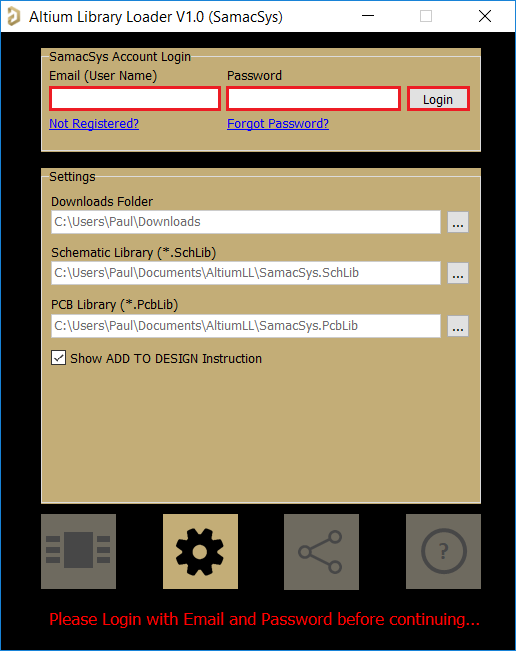 If you wish to share your experience with using Altium Library Loader, please click the Share button. 11. If you need further help or wish to get back to this page, please click the Help button.